Student designers were presenting their preliminary concepts – in costume, hair and makeup, lighting, scenery and props – at a meeting about “Tartuffe,” Ethington Theatre’s second play of the season. Each was hoping for a nod from Claude Pensis, the Dean of College of Fine Arts and Production and admired thespian who has led Grand Canyon University’s theatre program for more than three decades. Each feared they wouldn’t receive it. “If Claude disagrees, you won’t die,” Assistant Dean William Symington, Scenic Designer and Properties Designer, told the theatre majors who have been tapped for designer roles. “Claude won’t hate you, either,” Costume Designer Nola Yergin said, flashing a brief smile. In order for Tartuffe to be eligible for the Kennedy Center American College Theater Festival’s regional competition, students assume roles typically held by professionals. With his quiet voice, sweet countenance and unfailingly polite demeanor, Pensis – who celebrates his 35th anniversary as a GCU employee on Friday – is about as humble a man as you could ever hope to meet. 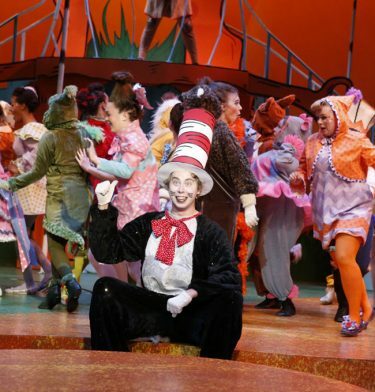 You might say he speaks softly but carries a big stick, for he is a lion in the theatre world, a gentle but firm taskmaster who demands the best – and gets it – from performers and designers alike. His observations are treated as precious gems. It was these gems that lighting designer Tarnim Bybee, a junior, sought in presenting her vision for Tartfuffe, which involved pinks, oranges and blues filtering in like diamonds through glass windows. Her job was all the more daunting because Pensis is typically the lighting designer. It was what hair and makeup designer Trustin Adams, also a junior, wanted in presenting an elaborately coiffed French period wig made of foam and paint for performers to don in Tartuffe. The play, which opens Oct. 13 at Ethington Theatre, is about a wolf in sheep’s clothing who fools, infiltrates and tries to ruin a French nobleman’s family. It follows Ethington’s first production, “The Good Doctor,” which opens Sept. 1. Pensis, who joined GCU on Sept. 1, 1982, is the University’s longest-serving employee. The gratitude he felt when he first stepped through the gates has only grown, as has the program – from a few hundred to nearly 1,000 students. “I count my blessings every day,” he said. As is his way, he modestly deflects attention onto colleagues, administrators and, mostly, students. He said he counts the history of the Fine Arts program by the success of the graduates. 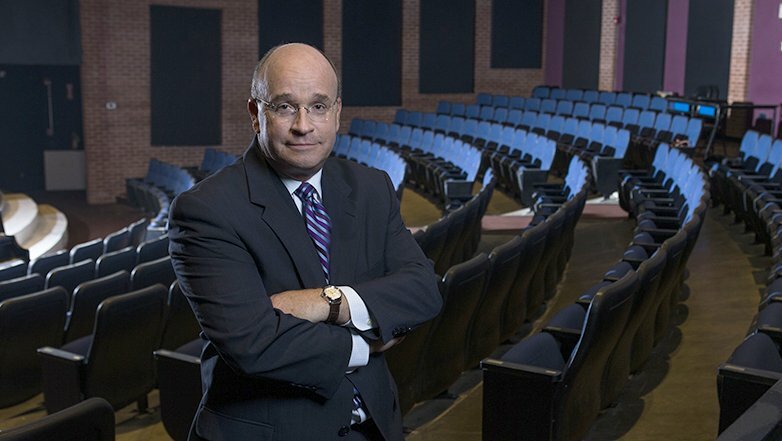 “His passion for quality work that matters, that entertains, inspires and trains students in the best possible lab experience – live, professional quality theater – has made the GCU theatre program a very special place. Generations of students, parents and their children have come to GCU to study theatre under the tutelage of Claude Pensis. In turn, Pensis describes Symington’s arrival as assistant dean in 2010 as a defining moment in the history of his flourishing program. One of the most transformative changes at Ethington Theatre in Pensis’ tenure has been the improvements to the stage lighting system. It has grown from 12-24 dimmers to nearly 400. Pensis is especially happy that GCU has a reputation as a singing and dancing school, particularly since when he first started working here 32 years ago the Southern Baptist roots were more strongly influential. Assistant Dean Dr. Juan Hernandez has helped carry on the tradition. “And the advent of the Pep Band (led by Paul Koch, GCU Director of Bands) also helped bring back the music,” Pensis said. 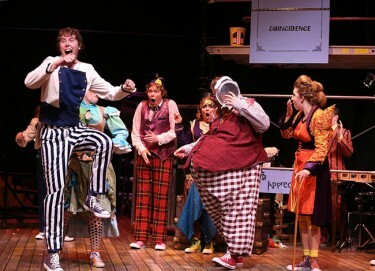 Students from the cast of “Scapin,” who performed at Ethington in 2015, also competed in the Kennedy Center regional festival in Hawaii that school year. Pensis heaped praise on drama instructor and frequent show director Michael Kary, Digital Film Director Lisa Tervo, Digital Design Director Sheila Schumacher, Dance Director Susannah Keita, Musical Director Mark Fearey and all those with whom he works. Pensis’ discovery of theatre when he was a high school senior capped a childhood in which he studied the violin and photography and played four sports. He earned a B.S. in Speech/Theatre from the University of Wisconsin-Oshkosh and a Master of Fine Arts in Stage Direction from the University of Wisconsin-Madison. 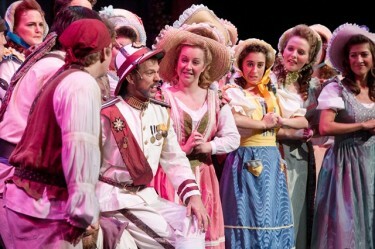 His first GCU position was chair of the Department of Theatre and Drama. One of his first initiatives was enacting the five-production Ethington Theatre Series, still in place today. In 2005, he became interim dean of the College of Liberal Arts and Studies. But the following year, because of the University’s financial woes at the time, theatre and the drama department were shuttered. It’s not a time Pensis likes to talk about. Fast forward five years later. Thanks in large part to Pensis’ commitment and leadership and to GCU President Brian Mueller’s vision, fine arts returned to the University in the form of COFAP. 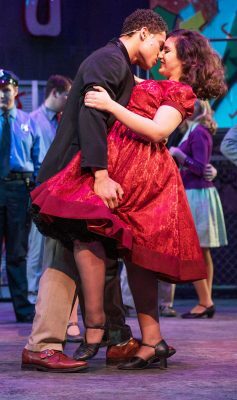 Ethington Theatre shows – which last season included “The Mousetrap,” “Of Thee I Sing,” “Our Town,” “Two Gentlemen of Verona” and “West Side Story” – have become an increasingly hot ticket. The last two shows of the 2016-17 season sold out. More satisfying from Pensis’ perspective is that a growing number of students, and not just theatre majors, are trying out for roles. More than 180 auditioned for West Side Story. From his front-row seat, Pensis has enjoyed the tremendous growth of GCU during Mueller’s tenure. Pensis gets good reviews, too – from both staff and students. His legacy at GCU is well-designed.